Thai people like to celebrate. There are many festivals during the year. 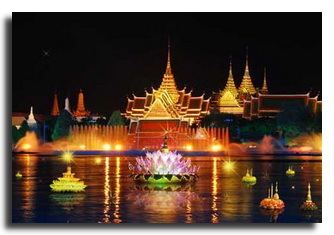 "Songkran" and "Loy Krathong" are two of the most famous water festivals of the year. At the water festivals people put small handmade boats or rafts with candles and offerings into the water and watch them floating along rivers and canals. Each region in Thailand has its own special festivals. Festivals take place every year, but not always at the same date. The reason is the lunar calendar, that is used to plan the beginning of festivals. In contrast to an European country, supermarkets are open during public holidays in Thailand. Small retail outlets and family owned shops are closed during Chinese New Year and Songkran. This winter fair takes place in January and is an unique event. If you like to see beauty contests and boxing fights or want to buy locally made products, you should visit this loud and colourful event. This festival is well known for its light and sound shows. More than 700 actors and 2 elephants are presenting the history of Thailand (end of January - beginning of February, at Ratchaworadit Pier, Bangkok). In the north of Thailand you can find many beautiful flowering plants. The flowers bloom at the end of the cool season. This flower festival takes place in Chiang Mai for three days. During the festival there are beauty contests, local people sell handicrafts, flower displays and a parade of decorated floats. It all happens to entertain people who are a part of this special event. During this festival Thai people celebrate the Chinese New Year. It takes place at the Yaowarat road, also known as "Chinatown". A part of the Yaowarat road (1km stretch) is decorated with flowers and Chinese lanterns. Don’t miss the Golden Dragon Light and Sound Presentation, the International Dragon and Lion Parade, the Chinese Opera and further interesting cultural performances. (Dates are changing from year to year according to the lunar calendar, usually around 1-2 February). This festival is famous for doves. Numerous people from Thailand and its neighbouring countries meet in Khwang Muang Park in the Yala Province to show and see all different kinds of doves. What makes this event so special is a dove-cooing competition with over 1400 participants. Songkran is the best known festival in Thailand, where people celebrate the Thai New Year. It takes place between 13th and 17th April, according to the solar calendar. During the festival Thai people visit a temple to make merit. They also clean their homes before leaving. After doing all the necessary things, the real fun begins and people throw water over everybody who is passing by close to them. Big advantage of this action is the possibility to get to know to locals and tourists. In the past Thai people celebrated this festival in a different way. The water was only poured over ones hands as a blessing. Today people use water pistols to make other people wet. 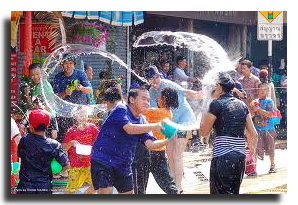 The Songkran Festival is very popular in Phuket, Koh Samui, Bangkok and Chiang Mai. During this festival people celebrate the birth, enlightenment and passing of Buddha. When it’s getting dark you can experience processions of worshippers at almost every temple in the Kingdom. It is not a big secret that rockets are the focus of this 2 days festival. People living in northeastern villages of Thailand create many different kinds of rockets. They believe, that launching the rockets will send plenty of rain that is needed during the rice-planting time. There is also a competition for the biggest and best rocket. People visiting this annual rainmaking festival are entertained by beauty contests and many other forms of cultural entertainment. Thai people celebrate the birthday of their Queen on 12th August. There is a big celebration at Sanam Luang in front of the Grand Palace. During the celebration you can see many famous Thai artists performing for free. Buildings along the Ratchadamnoen Road and other big roads are decorated with thousands of flags, lights and portraits of the Queen. 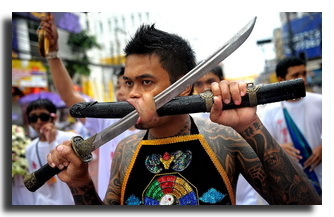 During this festival you can see people impaling their faces and bodies with swords and spears. It is a Chinese vegetarian festival that lasts for 10 days and takes place in Phuket. All participants take part in a big parade with arrays of sharp objects. People of Chinese origin from Phuket and other provinces don’t eat meat and oil from animals during this 10 days. Of course vegetarian food is available as long the festival lasts (September or October in Phuket Town). There are boat races in many towns along the Mekong river in September. But the famous annual regatta takes place in Phichit at the Nan river, that runs through the capital of the province. Wooden boats with motivated participants make this race day to an unforgettable event. (September at the Nan River, Tha Luang Pier, Muang District, Pichit Province). Thai people living in the northeast of Thailand (Isaan) celebrate the end of the Buddhist Lent during this festival. They use beeswax to form small miniature Buddhist temples and wax castles to gain merit. They believe that this act will stop their rebirth. 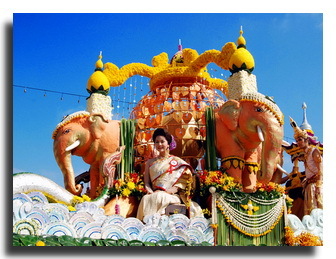 Especially in Sakon Nakhon this annual festival is very popular and present. There you can see an unique procession of wax castles, boat races and many traditional northeastern cultural performances. In Thailand, the water buffalo is a very important animal for its agriculture. But during this event you can see the buffaloes not the same way like on a rice field. Here there are buffalo races and fights buffalo against man. Loy Krathong is one of the most beautiful festivals in Thailand. It takes place every year during a full moon night in November. You can see thousands of candles fixed on small rafts, floating on waterways, canals, rivers and maritime regions. Compared with Songkran this is a very elegant festival. The krathongs or small boats consist of a banana tree trunk and are decorated with flowers and candles. Before the small boats come into the water, people do pray. They believe that the small boats take away all the bad spirits, bad luck and sins. Many hotels organize a special evening for their guests during the festival. You can see fireworks, hot air balloons, cultural performances and a fascinating light and sound show. Of course every member of the festival can put a krathong into the water and make a wish. The world-famous River Kwai Bridge is in the focus of attention every year at the end of November until December. People are celebrating in the Kanchanaburi province to remember the suffering and death of people who built the Death Railway. Japanese soldiers used this railway as a supply route from Thailand to Burma during the Second World War. This festival is famous for historical exhibitions, a carnival, cultural performances, a bazaar and a fascinating sound and light show. Impressing light and sound presentation to remember the glorious time of Khmer. During the festival classic Thai dance groups perform on stages. Further festival highlights are a historical fair, a parade with Buddha images and the final of Thailand's King's Cup boat race. (November in Phimai Historical Park, Phimai District, Nakornratchasima Province). There is a big celebration on the birthday of the Thai King in Bangkok and also in the whole country. The streets and buildings of Thailand are decorated with flags, fairy lights and portraits of the King on this day. Close to the King's palace there is a spectacular fireworks display. In Bangkok big crowds meet at Sanam Luang and at Ratchadamnoen Street on the fourth and fifth of December to celebrate together the King's birthday. The best known and most important regatta in southeast Asia takes part in Phuket waters on the first Saturday in December. Participants from the whole world take part in this unique regatta to compete against each other and reveal the winner.